Instructions for creating a contact form on your website. Creating a "Contact Form" page gives your members the ability to send a form to a pre-defined recipient. The recipient(s) of the form will be selected by the website administrator or page editor. Before you create the page, determine to whom you would like submitted forms to be sent to. If it's a group of people, such as board members, be sure to set up the group first by visiting the "Groups" section in the Admin Control Panel. To learn how to create a custom group, check out this article: About groups. First, go to the "Pages" section in the Admin Control Panel and click on the "Add new page" button. Enter the title of the page (eg. 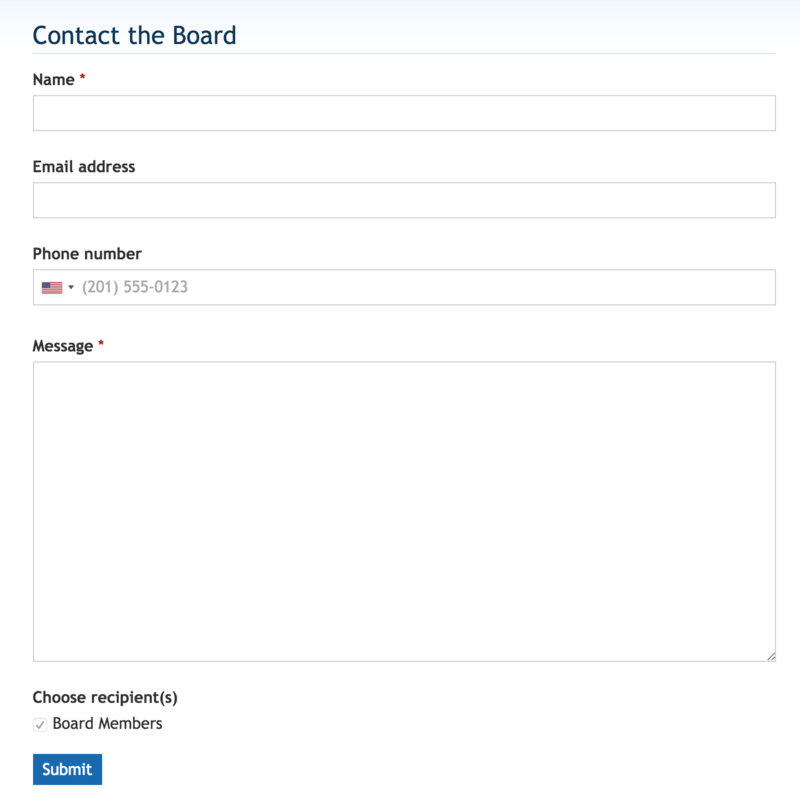 Contact the Board), then select the "Contact Form" page type from the list of options. Then, click "Add" at the bottom of the page. Before the fields on the form appear, you'll need to add at least one recipient. To do this, click the blue "Manage recipients" button. In the pop-up screen, click on the gray bar labeled "Add a recipient." Select the type of recipient; member, group, or email. In the second drop-down menu, select which custom group, specific member, or email address you'd like to receive the submitted form. Then, in the "Title/ matters handled" field, enter how the recipients will be listed on the form. This title will be displayed for the members to show who they are sending their message to. In the example below, the form will be submitted to the "Board Members" group and that is what will also display on the form. Lastly, click "Save." Once the recipients have been selected, the form will appear on the page. The "Contact Form" has pre-defined forms, so the members will just need to fill out the fields included on the page. Then, they'll select the recipient(s) they'd like the form to go to. If there is only one recipient listed (eg. only the "Board Members" group), they will be automatically selected.